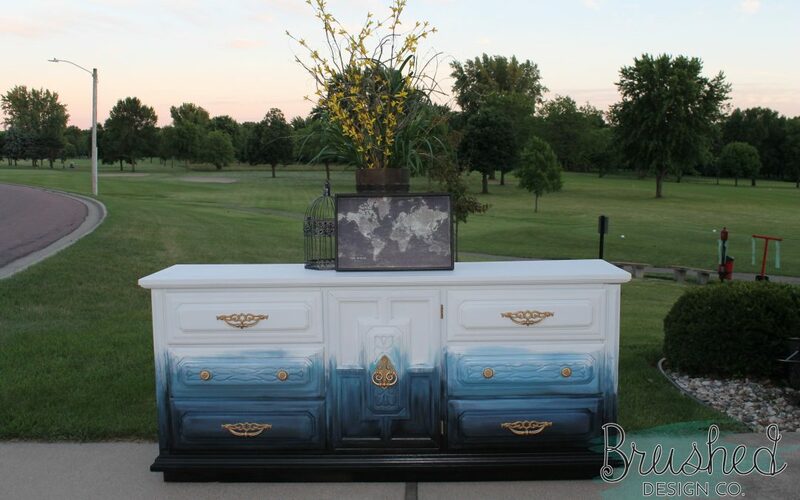 Painting an Ombré Design on Furniture - Brushed Design Co.
Ombré style painting is HOT right now! I’ve been anxious to try this technique but was waiting to find the perfect piece of furniture. 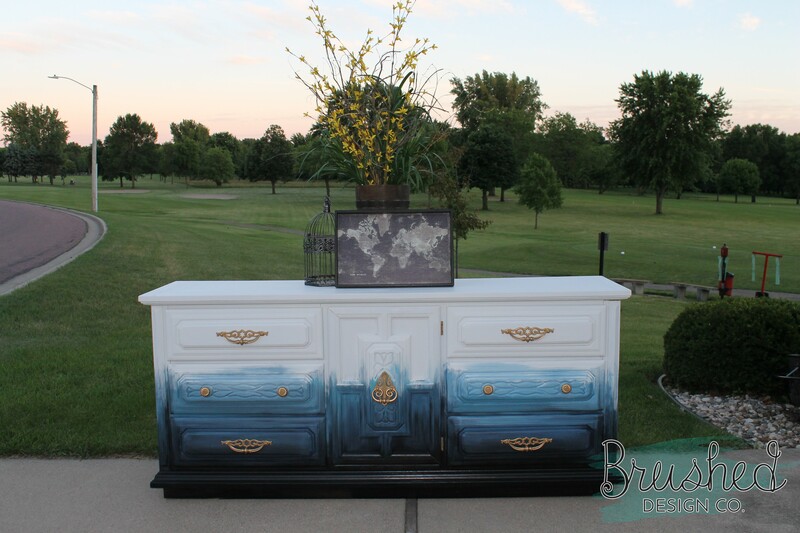 When I came across this buffet on a for sale site, I knew this was the one! 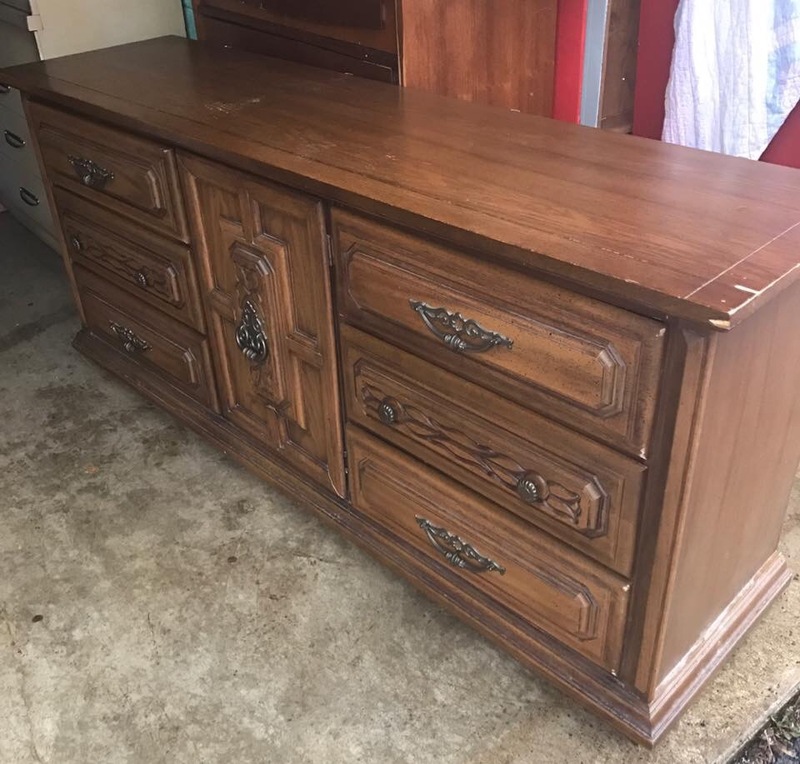 This buffet was in pretty good condition and was made of solid wood. There were a few chunks missing in the frame but nothing that couldn’t be fixed with wood filler. My favorite wood filler to use is Elmer’s Stainable Wood Filler. It dries quickly and sands down to a super smooth finish that goes unnoticable once painted. 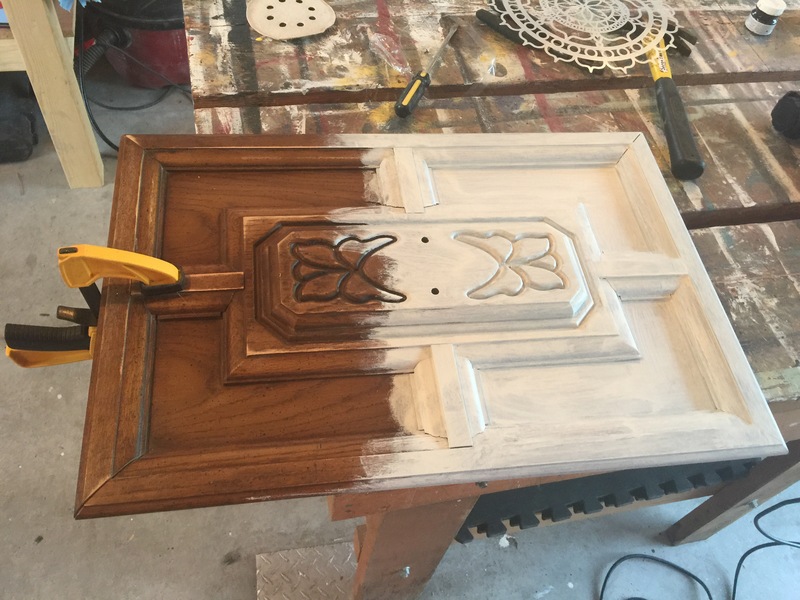 After a light sanding and cleaning, I painted the top portions of both the frame, door, and drawer fronts using Fusion Mineral Paint in Casement. 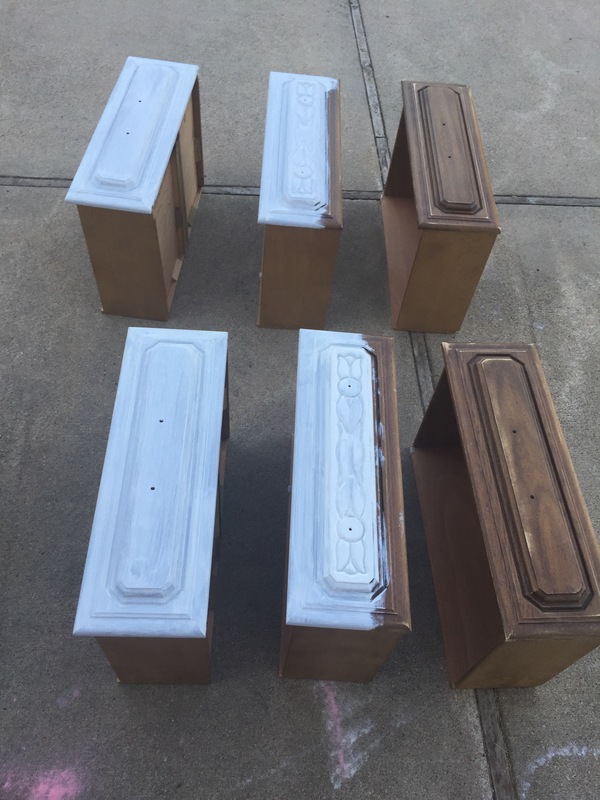 I also painted the drawers fronts from inside the middle door using Casement. This is my favorite bright white to use on projects and has excellent coverage. 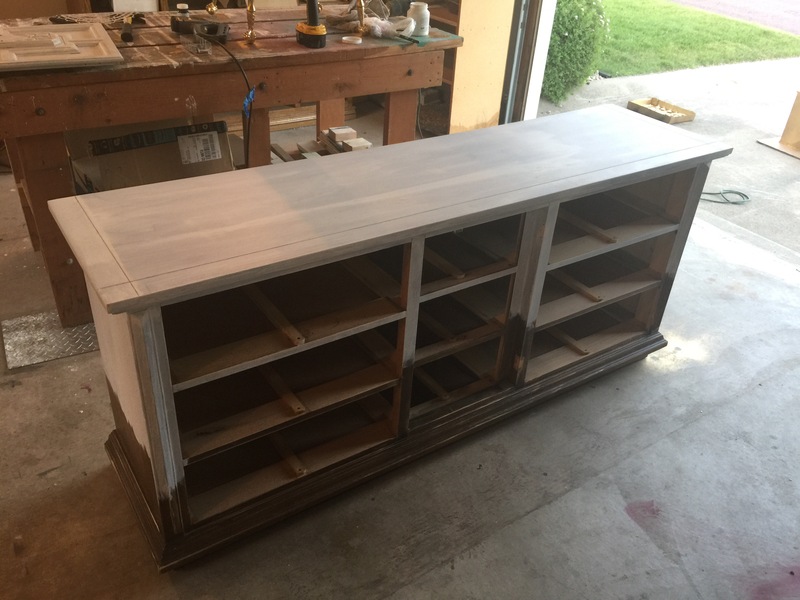 I painted about 3/4’s of the way down the buffet using Casement. After three coats of Casement, I let that color dry overnight before starting the ombré technique. I used three different blue tones for this project: Azure, Liberty Blue, and Midnight Blue (Fusion Mineral Paint). For the very bottom of the dresser I used Old Masters Gel Stain in Spanish Oak. I love using gel stain because you can apply it much like paint and go right over the top of an existing finish. Spanish Oak provided a rich espresso color which blended perfectly into the blue tones. When starting the blending, I started first in the middle with Azure, my lightest blue. Then working my way down using my medium blue (Liberty Blue) and my darkest blue (Midnight Blue). 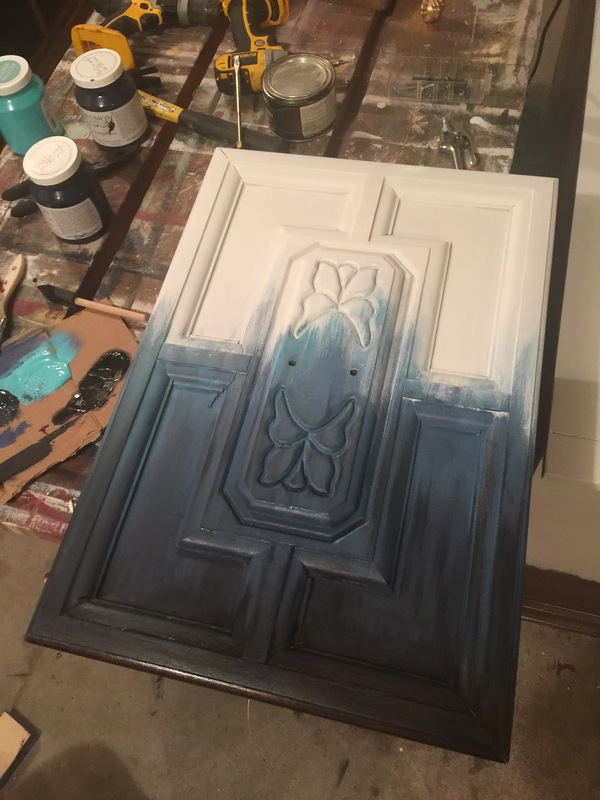 Once my blues were blended well with each other, I added the gel stain to the bottom and blended up. My last step was to use white to blend and draw the blue tones up further into the white section. You want to work in small sections and work fast as to not allow your paint to dry before you are finished blending. I had all my colors out on what you’ll notice as my super fancy pallet and used one brush. It allowed me to work quickly without having to worry about contaminating the containers of the paint and stain. I painted the door off the frame to give me a guide for the rest of my piece but reattached it when completing the remaing sections. I put the drawers back in as well to make sure the blending matched up exactly between the frame and the drawers. Once I had the colors finished, I moved on to adding the accents. 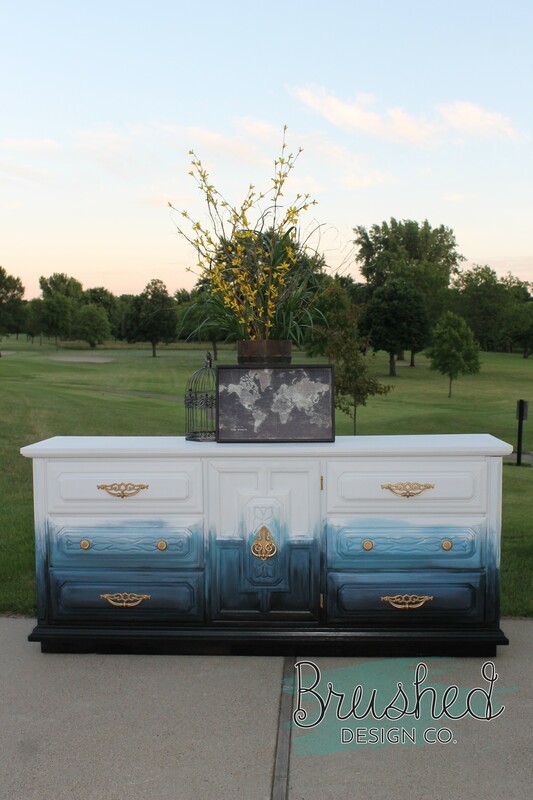 The original hardware on this buffet was very decorative and worked perfect with the style of the finished piece. 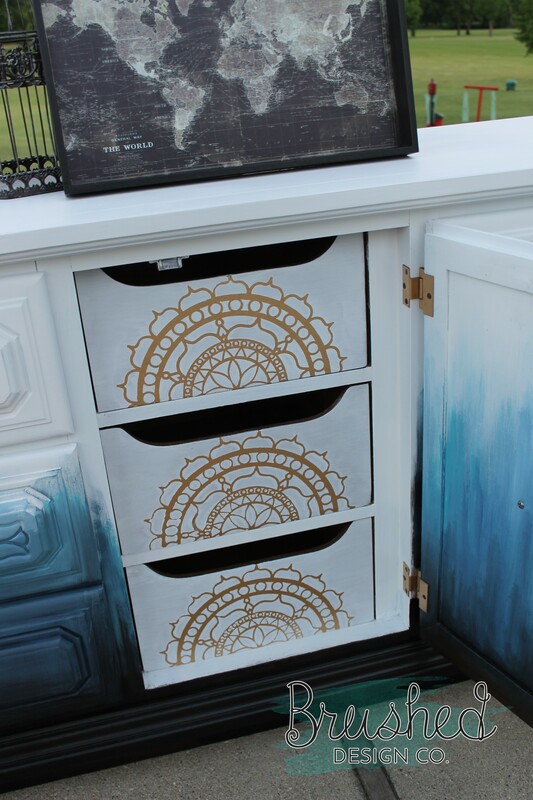 I used metallic gold spray paint to change the hardware color and also used it on the inside drawers with the half mandala stencil which I found here on Amazon. 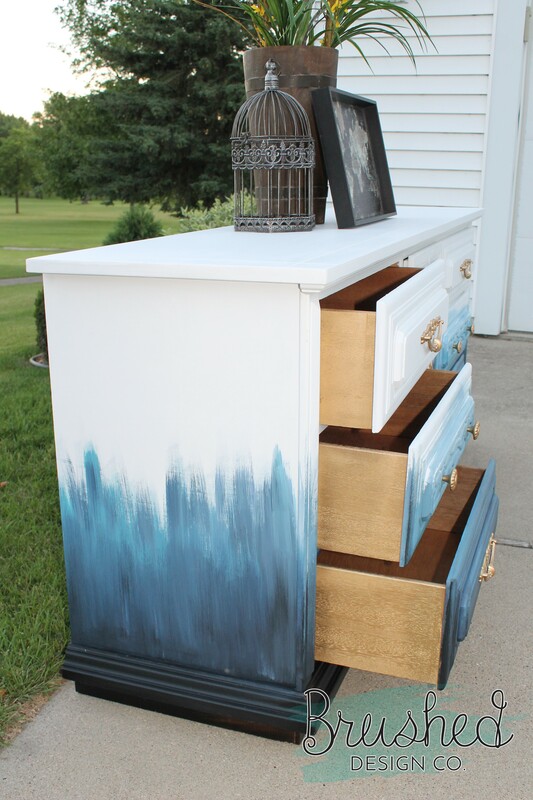 The finishing touch was adding a little more sparkle with the metallic gold on the sides of each drawer. The finished product exceeded my expectations! I love the contrast between the bright white and the blue tones. I especially love the way the metallic gold pops on the ornate hardware. It almost looks like the buffet is wearing it’s fanciest jewelry!